Thirty-two years ago, a newly trained organ builder was given a delicate job — to help move the Orpheum Theatre’s Wurlitzer pipe organ to its new location at the Sioux City Auditorium. Had it been left at the Orpheum, it would have been destroyed. The theatre — constructed by Rapp & Rapp in 1927 as part of the Orpheum Circuit — was about to undergo some major renovations. Once home to symphony performances and hosted by entertainers such as Fred Astaire and Katherine Hepburn, the remodeled Orpheum became a one-story movie house with a projection booth carved into the former mezzanine balcony. There was no place — and no use — for the $60,000 Wurlitzer organ that for years had provided silent movie sound effects. There also had been leaks in the Orpheum’s cooling system, badly damaging the organ’s pipes. To save the organ from its certain fate, area women’s groups held fund-raisers to support its transfer to and safekeeping at the auditorium. Thirty-one years later the organ builder was back, this time with a far greater assignment. His mission: to restore the magnificent organ to its opulent grandeur and then return it to its original home. 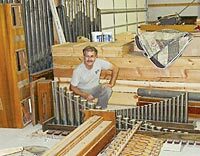 In August 2002, Rick Darrow of Onawa’s Darrow Pipe Organ worked with his staff to dismantle the 7-ton chest of over 1 million fragile pieces. Together, they hauled it section by section back to Darrow’s shop where they would take apart, clean, replace and rebuild one of Sioux City’s greatest treasures. A concert this weekend at the Orpheum Theatre featuring the All American Concert Band will support the restoration effort. With proper care and maintenance, says Darrow, pipe organs — including the one at the Orpheum — are built to last a lifetime. Though the restoration process is long and comprehensive, it is putting it all back together and then playing the ebony keys that drives the master craftsman. A summer apprenticeship to organ builder Lee McGinnis changed all that, as well as the direction Darrow’s life took. “I ended up being his apprentice for a year and a half, and have been building and servicing pipe organs ever since,” he says. That was 1971. In 1990 he moved his business to Onawa where he and his wife, Lois, now employ eight full-time workers and a few on a part-time seasonal basis. Twice a year they tune and service organs at more than 300 churches and build and restore pipe organs throughout the Midwest. When: Sunday, Oct. 19, 7:30 p.m.
Where: Orpheum Theatre, 523 Pierce St.
Tickets: $10 for adults, available at the door. Recent projects include building and installing a new pipe organ for the 1st Baptist Church in Johnston, and another for a Des Moines church, as well as re-leathering main reservoirs and offsets for churches in Pocahontas and Correctionville. Darrow still services the first pipe organ he built, which is installed at the Epiphany Cathedral in Sioux City. “Building an organ from scratch can take up to four years including the architectural design, and restorations up to two years,” says Darrow, who has scheduled the Orpheum’s Wurlitzer for delivery in the fall of 2004. Dismantling an instrument comprised of many tiny pieces might seem a daunting task, but by marking, dividing and separating units, the process flows as smoothly as the music from its keys. The work began at the auditorium by removing the 16-foot tuba pipes, then wrapping and labeling each individual pipe. Once Darrow’s staff took apart the woodwork, gathered “toys” and final parts, a mechanical lift removed the console from its perch within the inside balcony walls. The three main chests and other primary pneumatics were then laid out throughout the shop in sections as they, and their contents, were prioritized according to placement within the organ. Rebuilding the chests comes next, which includes a tibia offset chest, a toeboard and the organ’s main chest. Upgrades to the switching system will enable any artist to use the restored Wurlitzer. Moving the organ back to the Orpheum will be an arduous process with its own set of challenges. The blower will be placed above the dome, delicate parts must be moved carefully, and the newly installed switching system will fill an entire room.